"Rachel and Sammy Learn About Trees" is not only an adorable story, but it is educational as well! 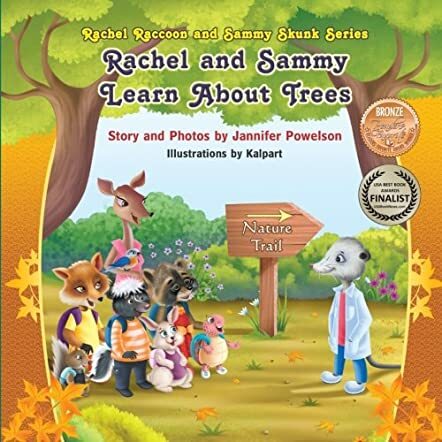 Written by Jannifer Powelson, the story is geared for young children and she also includes photographs to go along with what the characters learn about the trees. The illustrations included in this book are by Kalpart and there is a nice mix of "cartoonish" illustrations and actual photographs. Rachel and Sammy go on a field trip with their teacher, Mrs. Doe, and the other animals in their class. The animals begin walking on the Nature Trail and quickly begin learning fascinating facts about the trees that they see and also various types of leaves and bark. As the field trip continues the animals learn about various purposes of trees and the ways wood can be used. This is one of the best children's books I have seen which is both enjoyable educational! The illustrations will appeal to the children as they are so vibrant. The photographs included are excellent so that children will be able to use them as a guide to what they see in their own neighborhoods. Young readers will join this class of animals on their field trip to the forest and they will be learning so much right along with the animals. While there are a lot of words on the pages and a lot of information, the layout ensures that it is not overwhelming for children. The photographs are well-labeled so that children can learn to identify and recognize the various types in their environments as well. A very well-done book by both the author and the illustrator! This is my first book about Rachel and Sammy and I love the learning experiences taught in this book. In this story, they are learning all about trees. Rachel the Raccoon was excited about going on a field trip to the forest. And they were even more excited when they met their tour guide Dr. Opossum, and as he led them through the forest talking about the different trees, he asked and answered questions as they went along. Sammy and Rachel found it neat and interesting as they learned about the Shagbark Hickory tree, Pine and Oak trees, and all of the other trees out there. And they also got to see how each tree has different leaves and bark. This was a fun, interesting and informative trip for the two friends and their classmates. Join Rachel Raccoon, Sammy Skunk, Roxy Rabbit, Timmy Turtle, Stella Squirl, Fred Fox, Bobbie Bluebird, and their teacher Mrs. Doe as they take the journey of a lifetime through the forest, and experience the beauty they see on this journey. I highly recommend this book for your child, and for you as well. The story is wonderful, and the illustrations are amazing. I love the 3D effect, making it look as though you can just walk through the pages. And the illustrations and pictures added in the book go wonderfully together. I really, really love this book. And it is beautiful. If your child cannot read, do not worry, the pictures will tell the story and they will want to look at this book over and over.